Cannibalism and infanticide are disturbingly common in nature and in one species of non human primate the females are the worst offenders. 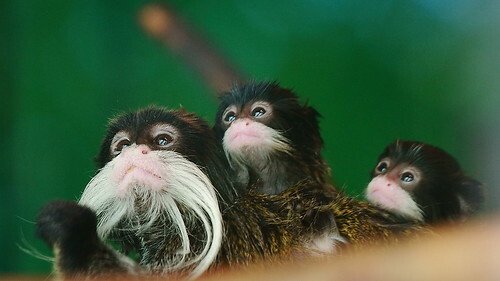 But what makes these revelations all the more shocking is that female moustached tamarins are not killing their competitors’ offspring, but their own. 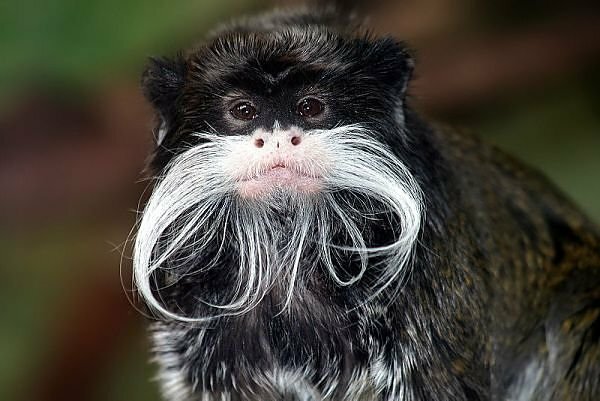 The moustached tamarin (Saguinus mystax) can be found in the jungles of Brazil and Peru. They have, in my opinion, the best handlebars outside of the human population. The females have a six month gestation period and only one female can successfully reproduce in each group, while the rest inhibit their ovulation. So already the pressure is on. These females often give birth to twins, and these are not small babies, so mum has quite a load to carry around while negotiating the swampy forests. In order to ensure these infants survive there has to be male co-operation, because it’s the males that do the provisioning and protecting. In the wild the rules are simple, if you want to ensure your genes are passed on, you must pro-recreate and protect your young until they are old enough to reproduce. But what if the costs outweigh the benefits? For humans there are plenty of other options available to us when things get tough, and in the vast majority of cases murder is certainly not the preferred choice of action. But for our nearest relatives the brutal reality boils down to the survival of the fittest. When the number of male moustached tamarins are low, a female will sacrifice her own kin, because she’ll weigh up whether it’s worth investing all her time, energy and resources into a baby that has a poor chance of surviving. You may recoil at such a thought but researchers observed this behaviour in three different groups and found that 75 per cent of infants survive when at least three males are helping, but only 42 per cent survive if the group has one or two male helpers. When a mother-to-be was the only gestating female in a group, the baby she gave birth to had an 80 per cent chance of surviving at least three months. When there were two or more pregnancies, that forecast plunged to just 20 per cent. The study led by an international team of researchers has been published in the journal Primates. One of the authors Yvan Lledo-Ferrer said:”Infanticide is an extreme behaviour, and in most species is used by males to eliminate competitors and make females become sexually receptive more quickly. In some cases, a baby would fall from a tree and receive only indifferent care when it hit the ground — which suggested that the mother either dropped it deliberately or wasn’t concerned when it fell accidentally. One of the explanations for these acts is that the Callithrix (genus of New World monkeys) are a very unusual kind of primate. They have a cooperative baby care system, in which all the members of the group participate, and raising infants is an extremely costly activity. For an infant to make it into adulthood the whole group must work together – after all it’s a jungle out there. these things happen in nature, but in human societies cannibalism was prevalent there too. if we did not have the capability to grow would we still be doing it today , without supermarkets and shops our food source would be grim too. I doubt you’d cause a riot with your comments Merlin, yes there are absolutely terrible cases of abuse and murder by people, but thankfully this is not the norm, and more of an exception. I didn’t so much mean that kind of violence and abuse which perhaps also have their parallels in the animal kingdom, but rather the calculated abandonment of female human offspring in favour of males – even before they are born. This has resulted in adult female populations being reduced in some towns to the point where the traditional labour roles and social structure are breaking down. As you said somewhere else – it’s a jungle out there! Hope you are being looked after in your workplace. Now, workplace care, there’s a whole other kettle of fish!